In February of 2018, Governor Sununu signed Senate Bill 247 Prevention of Childhood Lead Poisoning. 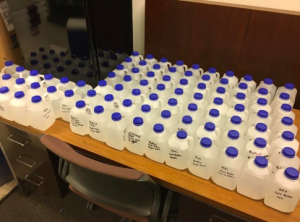 The legislation amended RSA 130-A, among other statutes, to require that all schools and licensed childcare facilities test their drinking water for lead. The first round of testing must be completed by July 1 of this year, which has left some school administrators and childcare facility managers scrambling. Not to worry. Here’s everything you need to know about protecting the children you serve and complying with the new law. Under the bill, all schools and licensed child care facilities in New Hampshire must test any location where drinking water could possibly be consumed by children — including washroom sinks, water bubblers, food prep sinks, water bottle filling stations, and more.The reason every site needs to be tested is because lead can seep into water from a building’s pipes, solder, and fixtures. Without testing every location, you cannot positively identify where the source of the lead is. One water location might test negative for lead, and another, located just a few feet away, could test positive. “While those who teach and care for our children obviously want to keep them safe, this can be a monumental task,” Vaughn says, pointing out that some of our state’s school districts could have up to 200 sites in need of testing. Effectively complying with this legislation goes behind the what and when. “The tricky part of compliance is the how,” he points out. Start by making a list of every location where children may access water. “Even that old water bubbler in a dark corner of the basement needs to be included,” Vaughn notes. From there, you’ll need to collect a sample from each of the sites, using bottles provided by a New Hampshire-certified laboratory. Vaughn points out that samples musts be “first flush” or stagnant at least six hours prior to collection. Once you get your lab report, you have five business days to publicly post the test results and your next steps (if any). Any locations showing 15 ppb (0.015 mg/L) or higher must be remediated within 30 days. Your remediation plan must also be submitted to NHDES within that time frame. The Secondwind team collected over 250 water samples in the Bedford School District as part of their SB247 compliance. Vaughn helps schools throughout New Hampshire develop lead remediation plans, which vary according to the level of lead contamination and the source. “You may have high lead levels at one site, requiring replacement of some plumbing and fixtures, or you could have lead throughout your entire system, suggesting you have a water quality problem that requires treatment,” he explains. Vaughn points out that it’s important to consider the age of the school’s plumbing system when making decisions around remediation. For example, if the system isn’t that old, Vaughn might recommend flushing it out and then re-testing it. “It’s important to gather all the information you need before deciding on a remediation plan. This is where our experience really helps the schools we serve,” he says. Managing water sampling, testing, reporting, and treatment on top of every other daily responsibility is difficult for most school administrators and facility managers. That’s why so many schools seek help from Secondwind, which is a New Hampshire-certified public water system operator. “Being a PWS operator, we’ll already familiar with how school water systems operate and what they need to do to meet state requirements. This is very routine for us,” he explains. “And if the school needs to come up with a water treatment plan, our being involved in the beginning makes things a lot easier for them,” he adds. If you have questions about SB247 or need help with compliance, contact the professionals at Secondwind Water Systems. We’ll make sure you know everything you need to keep your students safe and comply with state regulations before the July 1 deadline. PreviousPrevious post:Then & Now: Secondwind LeadershipNextNext post:Is Hard Water Ruining Your Clothes & Appliances and Hurting Your Wallet?